Love the outfit! 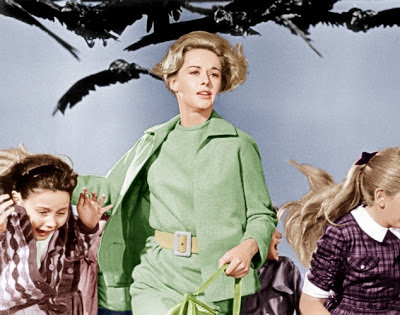 The Birds was the first Hitchcock movie I watched all the way through. I'll never look at a bunch of birds hanging out together the same! Did you notice Alfred in any of the movies you watched? He makes an appearance in every one of them (not a major character though so its always fun to try and spot him). Cute outfit and that county fair fabric is so fun! Great tribute. 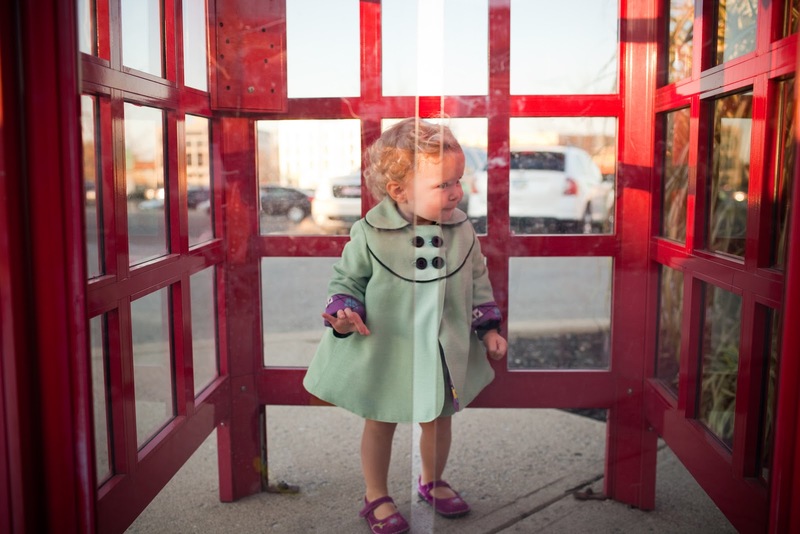 I love that the phone booth still exists, but there isn't a phone inside. Too much cuteness! I love that outfit and the model is WAY too cute and the pictures? Perfect! P.S.- I live 30 minutes from Bodega Bay, how cool would it have been to take the pics there!?! Love the Melanie Daniels look!!!! The black piping is awesome and I love the little skirt! It's been so fun sewing with you and Kristin and I love the nod to Strangers on A Train, which gets a little crazy with the whole merry go round scene at the end, so I'm glad it had some representation! This turned out soooooo perfectly!!! I'm just in love with the minty green and black piping, love the Strangers on a Train reference, love the Sailboat Skirt, love her ringlets. Fantastic job on the photos once again, Nick!! I love this little suit! So perfect. I always like the linings that add a pop of color and interest. i LOVE this outfit!! so adorable!! too too cute!! it's all perfect!! 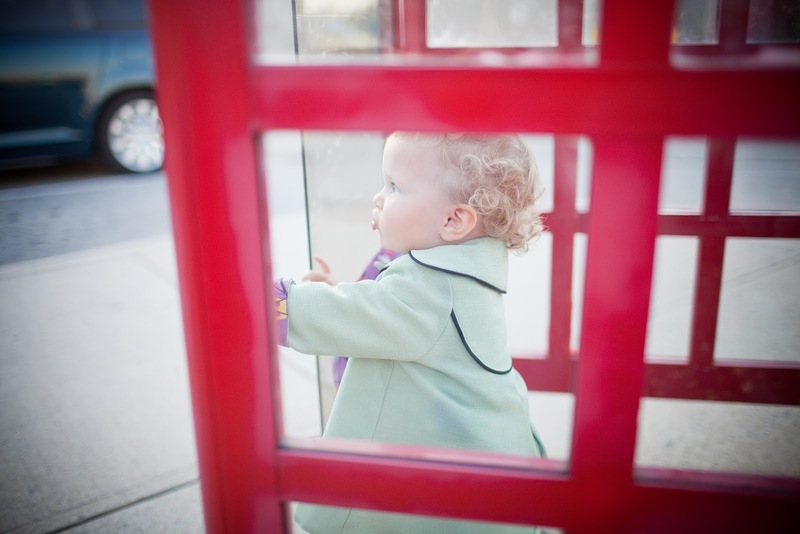 especially the phone booth photo shoot!!! I love this entire outfit! So very mod looking, and the color is so great. Your daughter looks so adorably cute in it! Darling outfit! I love that green and black. And I've never seen a hitchcock film either. Going to now though. Oh and that lining! And your photos. Lovely each. Such an adorable mini "Melanie"!! The suit is amazing!! That is SO cute! Oh my goodness. I love it. Awesome work! OH. MY. GOSH. I want to make that coat right now. You did everything perfectly here from the color choice to that piping. I just love it, Jessica! That is seriously fabulous!!! Great job! 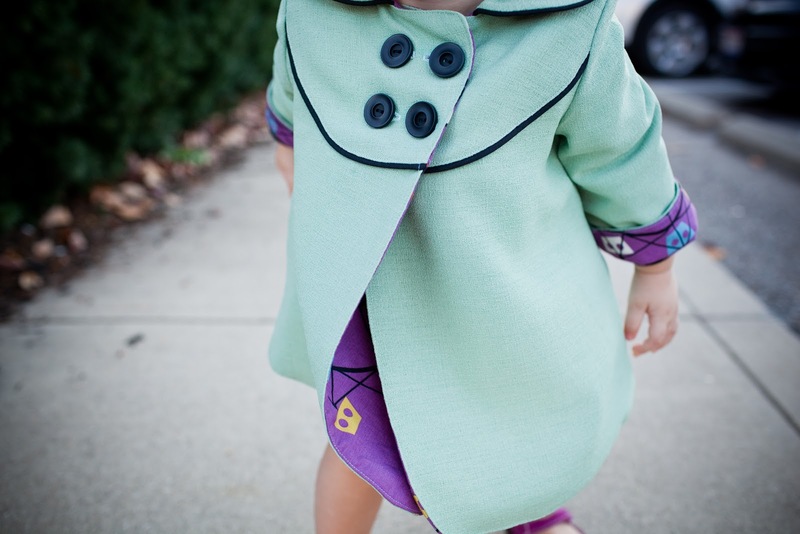 The piping and the buttons are perfection! I love that movie! You finally made the double breasted coat! It's so cute, the colors and styling are adorable! Love love love! Elsie is such a doll! The mint green suit is so perfect. And yes, I'm learning. Piping does make everything better. :)This FP might be one of my faves. You are the most clever person EVER!!! have I said that to you before? You just keep being amazing! Omg I la la LOVE it!! !it's mint and piping awesomeness!! I hope you guys tackle a Gondry film soooooon! This is so cute/cool Jessica! and fabulous photos, as always. Love it! That little suit is just too awesome! I definitely need to make one of those coats for Abby this year. Loved this post!! 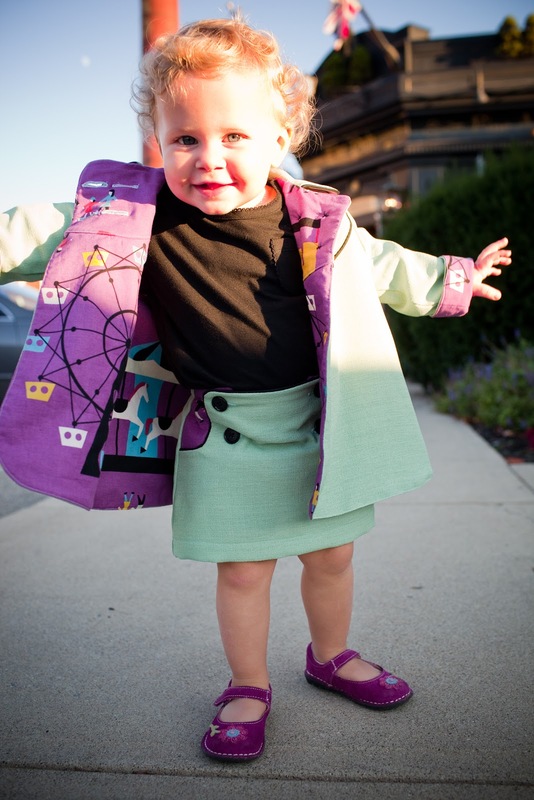 well yes, she is way too cute to be scary, especially in that little coat! that's the coolest lining EVER. and those photos - amazing!! so great! I think she did a fantastic job modeling for the shoot. Your outfit came out really cute. I love the fabric you chose for the jacket lining too! 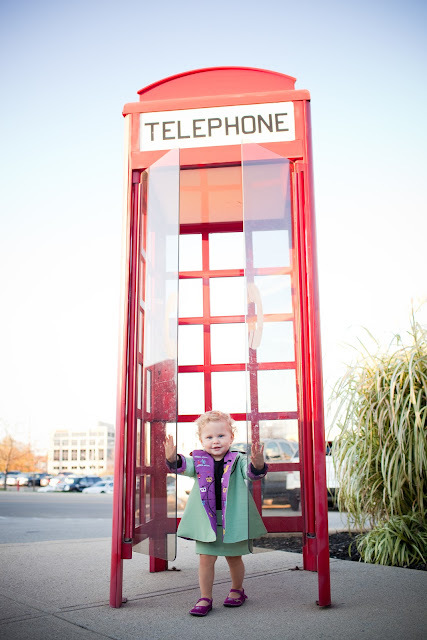 And who knew there were still phone booths anymore?? Hee hee - didn't Elsie get the memo that she's supposed to look terrified, not adorable!? This is so cute! I love the jacket! The piping, the lining - so awesome! I have yet to try the O+S Sailboat pattern even though I've had it for months already. The skirt looks great! 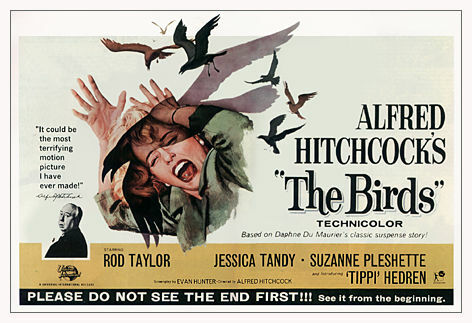 LOVE this installment - hilarious though that you hadn't watched Hitchcock before this! Your posts have got me itching to revisit some of my favorites. Perfect for Halloween! You do know the scene with her arm being picked was real? He made her do that! Nutter. Love the outfit and the photo shoot! 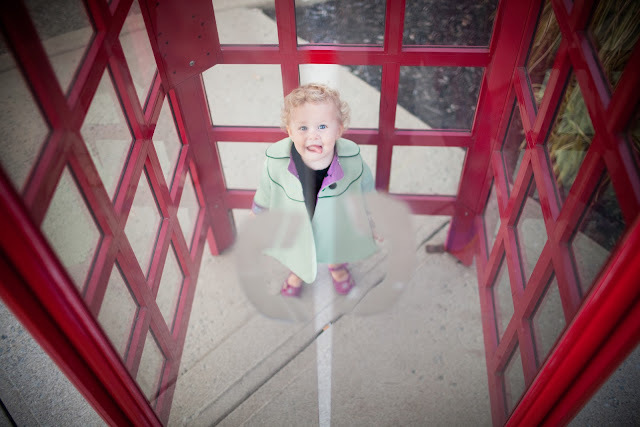 I love that you even had a red phone booth for the photo shoot! That lining so fantastic. Love all of it! What an amazing outfit. The coat is gorgeous and I love the lining. 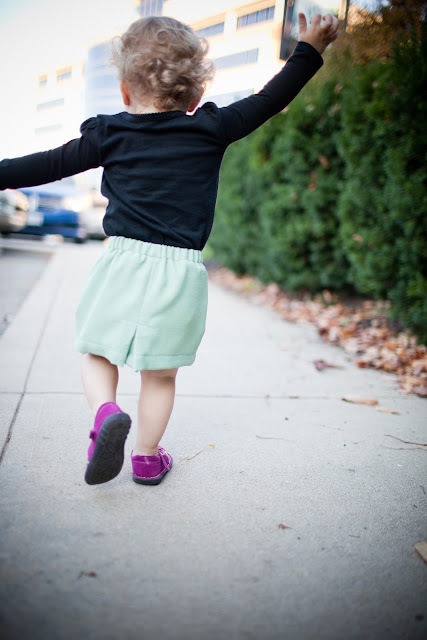 Elsie is absolutely adorable and the photos are wonderful. this is so beautiful and i agree piping does make everything better. the jacket is the perfect color. you are so talented my dear! The outfit is amazeballs, and little E is just the cutest. I don't blame her for her non-Tippi faces. She's just too sweet! Beautiful clothes, and a darling model :). 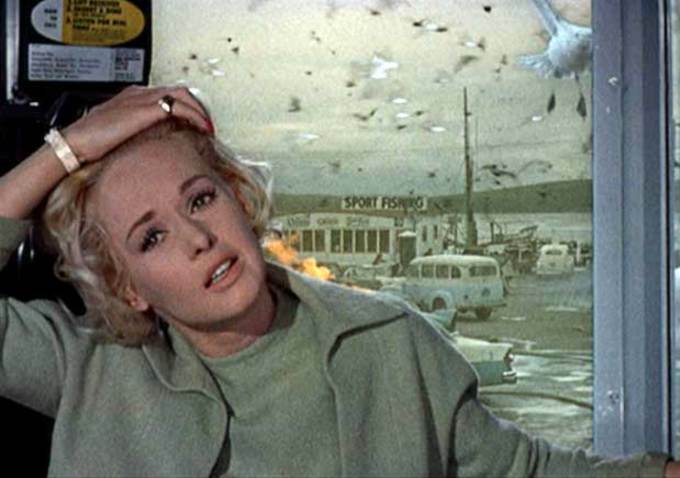 I heard/wrote a while ago that 'The Birds' was based on real events, birds going mad. And probably is/was the cause a sickness in mussel or oisters, enflaming the brain. And that in times no telephoneboxes were available.... creepy!